Drawing is an integral part of every childhood. It is a great way for kids to express themselves through their sketches and paintings. When they just start their journey into the world of visual art, They are passionate about every attend of a drawing class. But, how long this excitement will last? Nowadays children are surrounded by plenty of digital distractions. Art classes have to compete with digital devices, cartoons, and video games. Activities like visual art provide long-term benefits but also require long practice to see the improvement. That’s the main reason why it’s hard for children to keep the commitment to their art journey. This leads me to take a critical look at the current visual art education. I’m trying to understand the key elements for designing a better learning experience and how to provide the long-term engagement for children. In the design process, I spent a lot of time with children, talked to parents and teachers. I realized there is a need of designing an experience that could bridge the gap between the things children like to do and they have to do. Provide them with more instant feedback and also long-term engagement. So instead of having another digital game to only increase children’s ‘screen time’, we should use the strength of the game and technology to gamify the education and create a more playful and encouraging learning experience. 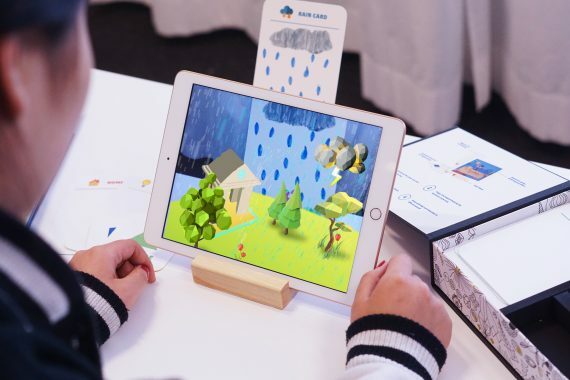 Artventure is a mixed reality learning platform for engaging long-term practice in the visual art context. It combines traditional visual art drawing activities and a virtual app with the AR technology. The game provides the curriculum which children could easily follow and see their progress. To finish the missions for the different classes, children will need to use the magical cards in the tool card package, drawing the mission on that, and turn on the AR experience in the game which they can directly use their drawing and influence the virtual characters and their stories. This feature adds additional engagement to the learning experience, gives children the feeling that their drawing has great power and could actually influence virtual characters lives. Encourage them to keep practicing without the feeling of doing a task they have to do. Artvenure uses the way children like to be taught, it aims to encourage children to keep practicing drawing while having fun and developing their creativity. It enables learning through playing and also gives children the long-term engagement, furthermore, help them to build the persistent mindset. It could benefit when they are learning other skills and subjects in the future. It also opens the possibility to unlock the potential future applications on designing an engaging educational product which enables children to express themselves and spark their creativity, I believe it could inspire the peer designers.